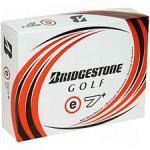 Here's a beautiful Bridgestone Driver. I'm a big fan of the traditional-shaped drivers, and this one meets my tastes. It still is a huge 460cc clubhead, and the rigid sole reduces driver spin and promotes a higher launch angle for maximum carry. Freddy Couples is the man! He's Mr. Cool, with the silky smooth tempo and the "I couldn't care less" attitude. He's the Bridgestone poster boy, and is also why I tried these Bridgestone Tour 330s.